It's awesome ... totally awesome! It's been 35 years since Fast Times at Ridgemont High first hit the big screen. Named in 2005 to the Library of Congress' National Film Registry, Fast Times at Ridgemont High is a cultural time capsule, a hilarious comedy, and a still-emotionally-relevant exploration of kids who want to grow up too fast. 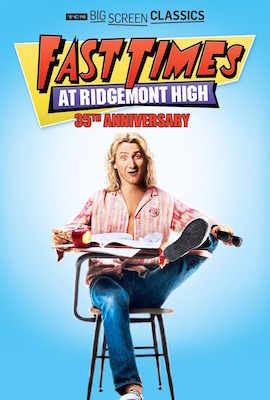 Join stoner dude Jeff Spicoli (Sean Penn), naïve sophomore Stacy Hamilton (Jennifer Jason Leigh), her managerial brother Brad (Judge Reinhold), the worldly Linda Barrett (Phoebe Cates), the shy Mark "Rat" Ratner (Brian Backer) and sleazy Mike Damone (Robert Romanus) as they experience the best and worst high school has to offer ... and take a trip back in time to the pre-digital world of 1982! Tickets are available now at FathomEvents.com or at participating theater box offices.